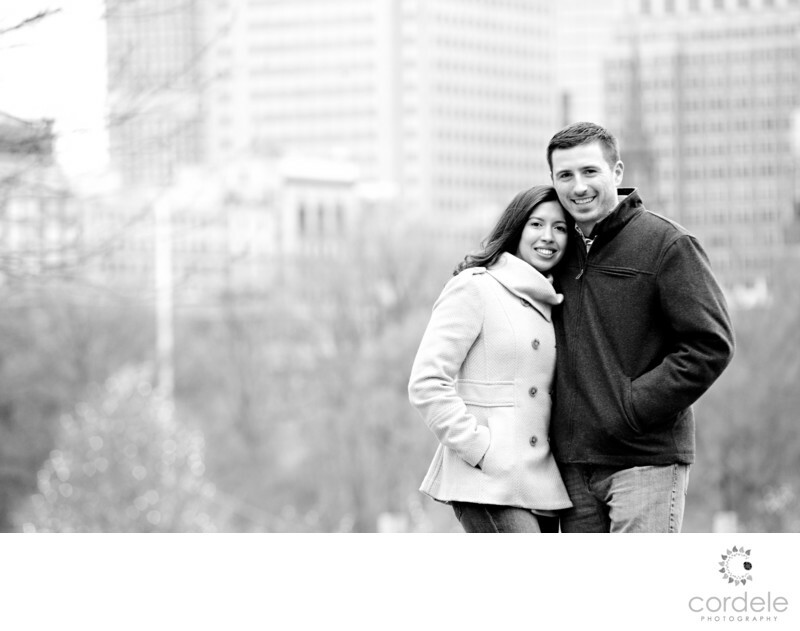 Couples come to Boston Common for their engagements almost on a weekly basis. Here a black and white photo of an couple standing in the Boston Public Garden with the city behind them. The Boston Common is known for it's Make Way for Ducklings statues. Its also known for its open green space and the relationship to the Boston Public Gardens in the spring. People come to the Common to have a picnic, play with their dog, go for a walk or get engaged! We did this shoot in the winter, and it was COLD. One of the problems shooting in the cold is the clients tend to look cold. What do you wear for winter engagement shoot? You want to look like a magazine add. Pinterest is your friend for a winter excursion outside! Carrie-Ann was smart enough to dress both of them in really cute pea coats. Coats can be a problem on shoots because they tend not to photograph well. These peacoats were perfect so even though it was cold, they were able to pull off a great shoot. I on the other hand, had a frozen hand. No one realizes I can't shoot in mittens. If the temperature is 12 degrees, my hand is 12 degrees. As a photographer I am use to making the sacrifice for great photos. The clients don't ever know how cold my hands are or how much I want to put the camera down when the wind starts whipping. Carrie-Ann and Brandon ended up getting married at the Codman Estate and you can see those photos on our blog.